Review: “A Hijacking” has a simple but effective plot regarding the capture of a Danish cargo ship by Somali pirates along the African coast. 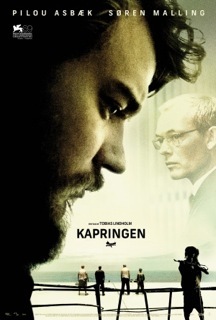 The story centers in two different fronts: on the ship, where the cook Mikkel struggles with fear and despair, and inside the naval-company premises in Copenhagen, where negotiations will take place in order to find a viable solution for both parts. The script rejected the usual violence or stirring situations, opting instead for a more psychological approach with proper doses of claustrophobia and impatience. Do not expect an electrifying film, since the negotiation process is slow, with ups and downs, and includes constant threats and bluffs. Whenever something atypical occurred, I expected some fierceness to arise. But that never happened. Hostile moments were scarce, only leading to stressful behaviors by the hijacked. The same cannot be said about the unexpected and shocking ending, which gave the final blow on the psychological study aimed by writer/director Tobias Lindholm. Despite the coldness and low profile maintained, “A Hijacking” cannot be disregarded, avoiding being manipulative and conveying a sensation of truthfulness.